Departing from Antwerp's Central Station in the weekend at 10 am and/or 3 pm, this bicycle tour takes you around the city's top attractions over the course of three hours. Hop on your saddle and pedal along the city streets as you follow your local guide on a tour that will pique your senses and get your blood pumping. 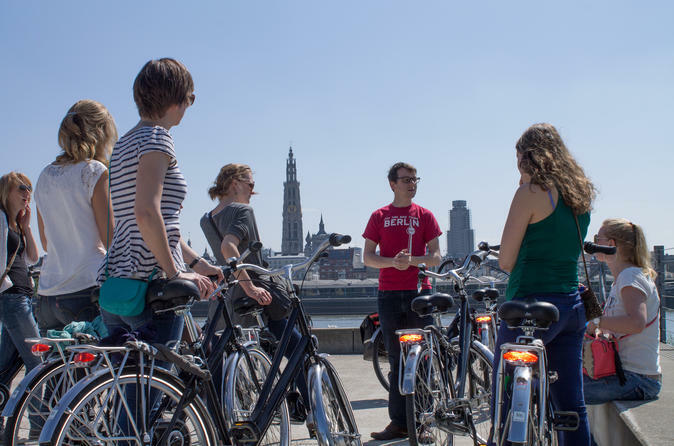 Experienced local bicycle tour guides will meet you at our shop at Antwerp's Central Station, and take you on a nice ride around the city's main attractions. At each stop, your guide will provide ample historical and current daily living information. Over the course of this comprehensive, 3-hour bike tour you will ride through parks, along the Scheldt river — and even through an impressive pedestrian tunnel underneath the river. You'll discover the lofty neighborhood surrounding the Museum of Fine Art ('t Zuid), the winding streets of Antwerp's historical center, and the up-and-coming waterfront neighborhood to the north. The price of the tour includes the cost of your bicycle rental, your helmet rental, and luggage storage. Be sure to bring a bottle of water and a snack to keep you fueled up during the tour.